Many thanks to What Mommy Wants! I'm kind of geeked about this! 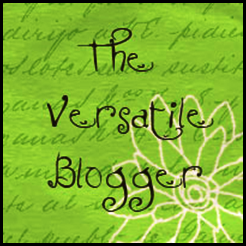 In a very sweet gesture, I've been recognized by a fellow mama-blogger and awarded the Versatile Blogger award. There's something really nice about being supported by your peers, isn't there? Thanks so much for the shout-out, Melissa! Getting this award means that I'm agreeing to share some things about myself, and pass on the love to fellow bloggers. I'm happy to do both! I was raised in rural Pennsylvania and even though I'm not a country girl at heart, I miss lots of things about living among farms and rolling hills. Mostly I miss people, though. I have a degree in psychology and was a few credits away from a degree in vocal performance. I decided singing wouldn't likely bring in enough income to justify an additional $40k in loans. I often write while holding my son. At this moment he is asleep on my shoulder. My husband and I met through okcupid dot com, which is embarrassing today because it has earned such a bad reputation- its not up-and-up like eharmony or something. But it brought us together, so I can't knock it too much! I was an Army wife for almost five years, and it was not my favorite life experience. I did meet many amazing friends. I'm really thankful that my husband is a civilian again, though there are lots of adjustments we have to make! I've written (or co-authored) at least four other blogs in the past, but this is the first one I've been consistently updating. I have fun writing WFB! I tend to become obsessed with certain television shows, and can watch them over and over. Examples include The Tudors, Gilmore Girls, Scrubs, and Modern Family. Now to pass on the love! Here are blogs I've been following for a while, or have recently stumbled upon. I think they deserve a gold star and acknowledgement for their efforts! Haute Clothed Buns - a great photo-review blog! Whirls Away - cakes so beautiful you'll want to eat your screen, and they're that good in person too! 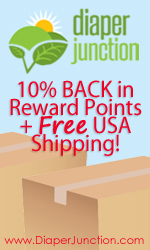 Naturally Thrifty Moms - especially check out their $20/week for 8 weeks stash-building project! E-Meal Planning - helping you decide "what's for dinner"
Modern Mama Reviews - lots of green living product reviews and giveaways! Kim's Krafty Koncoctions - beautiful art pieces and crafting ideas, especially great for card making! Post your award on your blog, and include the link for Wee Fluffy Bums in your caption. Share 7 bits of your life with your readers! Pass the award on to 15 blogs you think deserve some recognition for their hard work and great writing! Thanks for the shout out! Guess it means I finally need to publish an update, huh?! Thanks for the mention! I have followed your footsteps and created a blog post to accept this award. Thanks again! Aw, thanks! I feel so honored. I am terrible at remembering to put up recipient posts, but I've popped the button with a link back here up on my About page, at least! :) It was so great to learn new information about you — you've got a very interesting background! I'm holding my son at the moment as well, and leaning over onto the couch to type with (joy!) both hands. I'm honored that you chose my blog for this award! Thank you. I will be posting the badge shortly. It's always nice to meet fellow cloth lovers, and especially ones that are from this area. Before I made some more "mommy friends" I felt like the only one around who used cloth or talked about natural birth because my family is very much the opposite. Thank you for contributing to a growing community both online and off! Do you have a great cloth diapering product or business? I love reviewing diapers and supporting great businesses. I'm always open to partnerships to help spread the word about your wonderful wares. Contact me at weefluffybums (at) gmail (dot) com! More Cloth in the News! Coming Soon: Super Stash Saturdays! Haute Clothed Buns | exploring the fashionable world of cloth diapers one photo at a time!